What Happens to Your Body at Different BAC Levels? Alcohol is technically a psychoactive drug, as this substance affects mood, perception, memory, and other brain processes. In the United States, it is legal to drink if you are 21 or older. Most adults have at least one alcoholic beverage at some point in their lives, and 56 percent drink alcohol at least once a month. The National Institute on Alcohol Abuse and Alcoholism (NIAAA) also reports that nearly 27 percent of adults, ages 18 and older, binge drank in the past month, and 7 percent drank heavily in the past month. Over 15 million adults and 623,000 adolescents suffered from alcohol use disorder (AUD) in 2015. Any form of problematic drinking can result in personal, physical, mental, financial, and legal problems. In the US, blood alcohol concentration (BAC) can determine whether it is legal for you to drive or not. At a BAC of 0.08%, you are considered unsafe to drive. But what is BAC, and what happens to the body at different levels of intoxication? Blood alcohol concentration is a measure of the amount of alcohol in the bloodstream, which is an indication of how intoxicated a person may be. For example, a BAC of 0.1% is one part alcohol per 1,000 parts blood. Though it doesn’t sound like much, this level of alcohol in the body can cause serious side effects. Two to three drinks in an hour, depending on body weight, age, gender, and other factors, increases BAC to 0.1%. These effects begin at different BACs. With more alcohol processed through the body, they will become more serious. 0.02%: This is the lowest level of intoxication with some measurable impact on the brain and body. You will feel relaxed, experience altered mood, feel a little warmer, and may make poor judgments. 0.05%: At this level of BAC, your behavior will become exaggerated. You may speak louder and gesture more. You may also begin to lose control of small muscles, like the ability to focus your eyes, so vision will become blurry. Your judgment is impaired, and coordination is reduced. Tracking objects visually becomes more difficult, and your ability to respond to emergencies, like an object in your path, will be reduced. Your inhibitions will be lowered, although you will feel good and may still choose to engage in risky behaviors like driving. 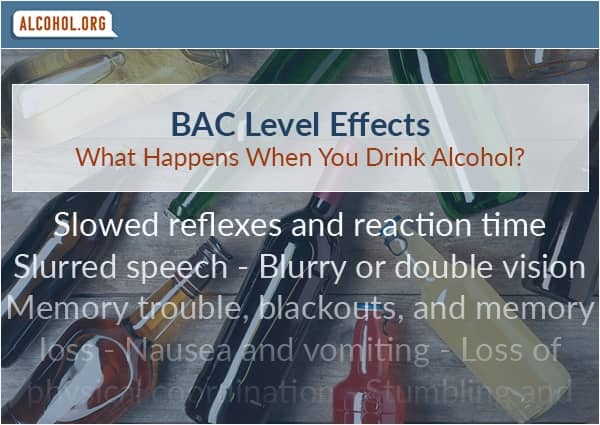 Some states in the US are lowering their legal BAC to 0.05% because problems with concentration and coordination begin at this level, so it can be a dangerous level of intoxication. 0.08%: This is the current legal limit in most of the US when it is considered unsafe to drive. You will lose more coordination, so your balance, speech, reaction times, and even hearing will get worse. Standing still, focusing on objects, and evading obstacles are all much harder. Reasoning, judgment, self-control, concentration, and memory will be impaired. Short-term memory loss may start. 0.3%: Stupor may set in, which is the brain essentially shutting down. It’s like passing out but you appear to be awake; however, you will be unresponsive to nearly all stimuli. There will be very little recognition or understanding of people or places around you if you remember anything. 0.35%: The level of impairment at this BAC is on a level similar to that achieved via surgical anesthesia. You are very likely to pass out, and you may stop breathing. 0.4% and over: This level may put you in a coma or cause sudden death because your heart or breathing will suddenly stop. Drinking two or more servings of alcohol in an hour will lead to intoxication, and continuing to drink a lot of alcohol will cause your BAC to rise. When you stop drinking, that does not mean your body stops processing alcohol at the same time. Digestion takes longer than consuming a drink does, so allow one hour for every beverage to metabolize out of the body. Getting drunk does not mean you struggle with AUD or problem drinking, but being drunk a lot or craving alcohol when you are not drinking may indicate potential problems. Get help from an addiction specialist at an evidence-based rehabilitation program to overcome excessive drinking, including alcohol use disorder.